People lie on their CVs frequently. In a recent CareerBuilder survey, it was found that almost 6 out of every 10 resumes received by HR departments contain false information, in some way or the other. The onus lies on the HR personnel to individually verify and backcheck all the academic and professional achievements cited by a prospective employee, as well as the references mentioned by him/her. The process, apart from being frustratingly time-consuming, can turn out to be financially expensive too. With the help of a reliable HR blockchain, fraud detection and all the necessary verifications can become easier, faster and more reliable than ever before – with all career-related ‘data blocks’ being stored in immutable resume blockchains. Ascertaining resume accuracy is a point of concern for entrepreneurs/recruiters across the globe, and blockchain technology will be handy in automating the overall screening process. Note: The prototype of a resume verification blockchain network is already in the final stages of development in Japan. In 2016, Recruit Technologies and Ascribe entered into a collaboration with blockchain technology for automated resume checking. From day-to-day expenses and employee performance tracking, to insurance records, payroll management, psychometrics and employment history maintenance – blockchain technology can help HR departments digitally store all the key information about workers, in a completely secure manner. This, in turn, will render the role of third-party employee contract/data maintenance agencies (in effect, middlemen) completely unnecessary. Prompt payments will ensure that people will be able to start working immediately, without any delays caused by recruiters/contracting parties. In the foreseeable future, the role of conventional financial, recruitment and employee contracts/data storage will gradually diminish – and decentralized operations will become more mainstream. The gig economy (alternatively known as the ‘access economy’) is growing fast. In the US, as much as 35% of the total workforce is made up by freelancers – the members of the so-called ‘on-demand economy’. By the end of this decade, this stat will rise to 43%. The need for quickly, and accurately, assessing the skill, knowledge, proficiency and relevant experience of the ‘contingent employees’ is rising – and that’s precisely where blockchain tech can have a big role to play. On a HR blockchain, third-party vendor credentials can be verified easily, since it is impossible to ‘edit’ records (blocks) at any node, without making wholesale changes to the entire network. In essence, the arrival of blockchain in HR will usher in a transparent, decentralized marketplace – one in which freelancers and companies/employers will be able to find and contact each other directly (no role for external recruiting agents). Note: In 2017, Australian startup ChronoBank started issuing Labour Hour (LH) tokens – in a bid to remove the uncertainties associated with payments and work commitments. Bitwage, a global wage management service, has already given us an idea of how blockchain can weed out the inherent problems in payroll operations. With the technology being embedded in the mobile and cloud space, the service automatically converts bitcoins to local currencies – so that workers can get paid in the latter. This process is particularly of help in overseas payroll management systems, where the frequent currency value fluctuations (high volatility) can pose problems for both employers and workers. What’s more, many intermediaries – banks and other financial institutions – are involved in international payroll systems, causing additional expenses and (often) inordinate delays. With cryptocurrencies being used as a payments standard, cross-border payroll processing cycles will be shortened considerably. By 2019, the number of ‘millennials’ in the world will overtake that of ‘baby boomers’. On average, millennials stick at a job for less than 3 years (for US millennials, the figure is 2.8 years) – and this relatively frequent ‘job-hopping’ behaviour adds to the challenge for HR professionals to keep up with the experiences and skills that potential employees might have gathered over time. In addition, education and academic achievements are evolving fast – with the advent of online training courses, availability of digital badges, and the huge pool of courses. It is possible to keep adding ‘certification blocks’ and/or ‘experience blocks’ to a career blockchain, and individuals can constantly monitor who gets access to such personal data (with ‘access keys’). Human resource management is, by default, data-heavy – and blockchain can do its bit to ensure that employers can find the best talents. Note: As the educational and/or professional experiences of candidates mount up, the chances of manual forgeries and impersonations also increase. Such risks can be avoided in a blockchain-powered HR system. Imogen Heap’s Mycelia has showed the way in which blockchain technology can help musicians make money once again. Similar ‘smart contracts’ – which are basically lines of code specifying what would happen if and when certain given conditions are met – can also be used by HR departments, to digitally manage issues related with employee benefits and policies. Records of employee awards and recognitions can also be stored securely in a blockchain network. According to experts, smart contracting would help in bringing about greater transparency, awareness and confidence levels for all parties involved – with everyone knowing the timing and circumstances of payments and other receivables (non-monetary benefits) at all times. All digital processes related to HR management can be made streamlined and efficient with decentralized ledger systems. Third-party employment agencies, at times, can offer misleading information about a particular job-seeker. This, in turn, makes it doubly difficult for recruiters to find the true qualifications and capabilities of that person. Satoshi Nakamoto’s blockchain tech opens up the possibility of the creation of fully sovereign digital IDs for employees. They will have full control over such IDs – and all the data included in a particular ID will be added after due verification by the concerned parties. Yet another advantage of such digital IDs will be that the ‘owners’ will be able to allow and track access by dedicated ‘digital tokens or keys’. Instead of having to manually check the references of applicants, HR departments can simply request access to the digital ID blockchain – which will have all the certifications cross-verified by the concerned authority (say, a university). Considerable time will be saved in this way – and the process would be that much more reliable. 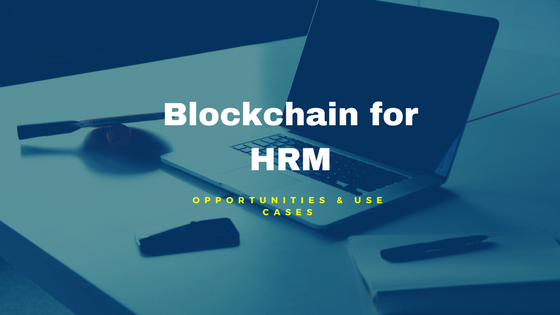 Note: As in the financial and other sectors, blockchain in HRM will help in bringing back the ‘trust’ factor to recruitments, employee management processes and payroll systems. The University of Calgary and Massachusetts Institute of Technology have already made some progress in this context. While the former lets students to enroll in the digital co-curricular records, the latter has piloted a full-blown diploma program – that offers students a completely certifiable digital diploma (a traditional diploma in physical format is also provided). The high-end education transcripts in such digital certifications ensure that there are no chances of data manipulations at any time, and only the authorized personnel will be able to decode and view it (in our case, HR recruiters). Irrespective of whether one works to work as a traditional corporate employee or a provider of ‘talent-on-demand’ – digital certificates stored on HR blockchains will benefit everyone. The importance of blockchain technology for resume/background verification of candidates has already been highlighted. However, that’s not all there’s to it – and decentralized ledgers can also be used to store and manage different types of important transactional data, like employee tax documents, address changes, and even emergency medical records. With uncertainties cleared out and every corporate record digitally stored and shared – the implementation of blockchain should also help companies in acquiring seed funding with greater ease. A number of leading tech vendors are already experimenting with alternative HR blockchain options – which can deliver multiple compatible advantages in the Industry 4.0 regime. This would call for a fine balance. There are locations where recruiters are not supposed to make enquiries about the previously drawn salaries of workers. However, if that data is stored on the blockchain network, and the recruiters are given access – this information can be viewed without the explicit permission (or even knowledge) of the concerned job-seeker. As a result, probable cases of privacy violations, and consequent legal hassles, might arise. There is considerable speculation over these matters at present – and it will be interesting to find out how enterprises decide to maintain long-term records of their employees in a shared digital network. The key would be to implement HR blockchains in a way that delivers benefits to everyone, without compromising anything or anyone. Smart contracts in distributed blockchains also help in verifying work permits (from international workers), as well as for calculating/recording employee retirement benefits. In fact, many manual management functions can be replaced by blockchain software. It has to be, however, kept in mind that the technology cannot, and is not intended to, replace human presence in the HR sector. Instead, it will help the professionals in this domain gain access to ‘better’ information quickly, and perform more efficiently. It’s still very early days for blockchain technology in HRM. Challenges remain, primarily in the form of lack of knowledge and awareness about the technology – as well as the problems with finding present scenarios in which historical information can be relied upon. For starters, the role of blockchain will be limited to automated verifications and learning – and if the results are as desired – the technology can be expanded to more of the use cases listed above. 2018 is widely expected to be the ‘year of the blockchain’, and the transformational benefits on the HR sector should become evident before the year is out.